Grumpy Cat has millions of social media followers, shots of her famous frown go viral, and fans clamor to catch a glimpse. Face it: Grumpy Cat is a celebrity, and guess what? She probably makes more money than you do! 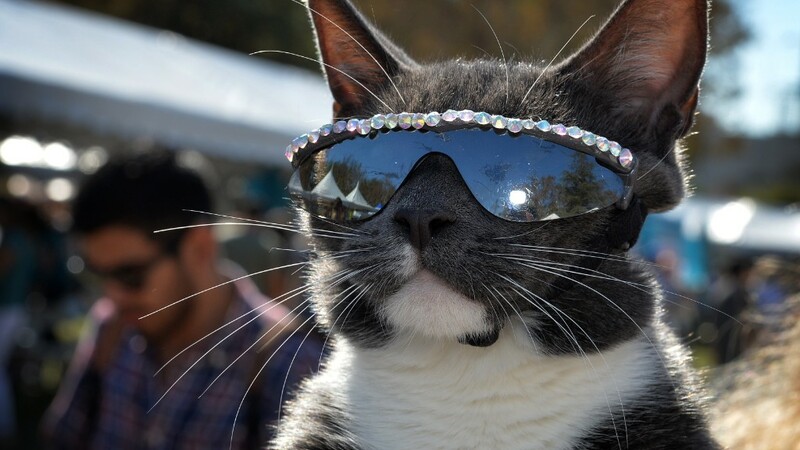 Grumpy Cat is part of an elite group of furry animals around the globe who have shot to Internet fame in recent years. 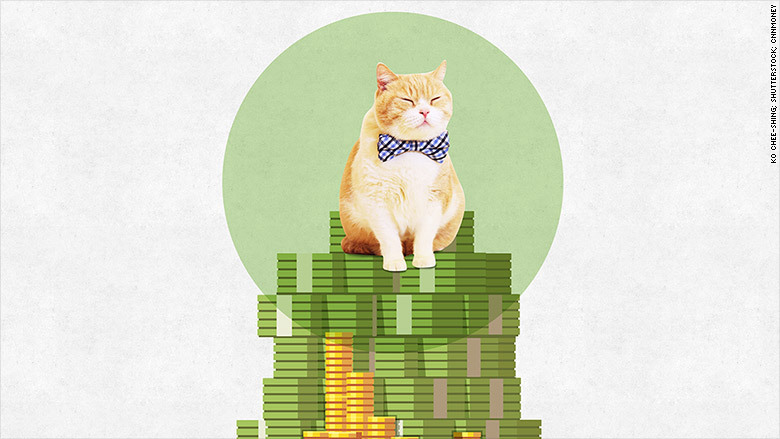 These fuzzy creatures sign book and movie deals, do photo shoots, and act as "spokesanimals" for ad campaigns -- netting piles of cash for their owners. Experts say the phenomenon is made possible by the rise of social media, which is changing how we interact with lovably fuzzy creatures. Social media "adds a personal connection, so if you're interested in a character like Grumpy Cat, then either people will send you more anecdotes or videos, or you can go and seek it out," said Karen North, a social media expert and professor at the University of Southern California. It's "a way of getting entertainment in the hands of audience members who become evangelists of the content, and spread it wider than the originator ever dreamed," North said. Owners can monetize their pets via multiple sources -- product endorsements, licensing agreements and even original merchandise. It all starts with building a massive following online. Viral pet owners can also consider registering a trademark, whether it's a name or a distinctive feature, to help protect against any copycats, said Marty Brochstein of the International Licensing Industry Merchandisers' Association. "Is there some specific recognizable aspect to it that makes it other than just a cat?" Brochstein said. "In terms of bringing in business, it's just like any other celebrity -- you have an agent who is either fielding offers or ferreting out business opportunities." Grumpy Cat, for example, has an easily identifiable sourpuss face -- the product of an underbite and feline dwarfism, a genetic condition. The look has entranced millions of web followers, leading to Grumpy Cat designer apparel, a New York Times best-selling book, a movie and a coffee brand -- Grumppuccino. 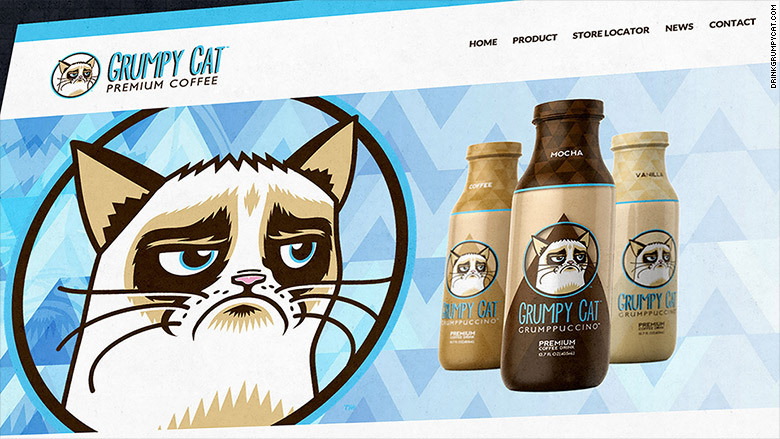 The licensing and merchandising deals have translated to buckets of cash for Grumpy Cat's owner, Tabatha Bundesen. "Grumpy Cat is making millions!," said North. "It's shocking!" Bundesen didn't respond to requests for comment. 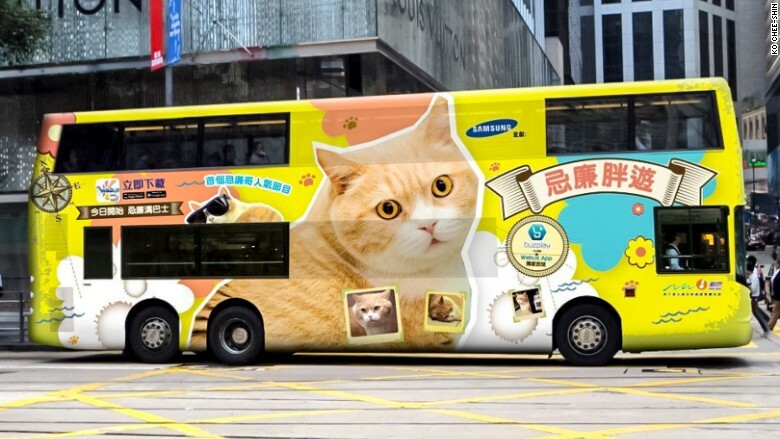 And yes, Grumpy Cat has a manager, as does Hong Kong's own celebrity cat, Brother Cream, a chubby white and tan feline who lives in a local convenience store. Brother Cream has thousands of social media followers, and fans who visit from around the globe want to know about everything from his bowel movements to public appearance schedule, owner Ko Chee-Shing said. Like Grumpy Cat, Brother Cream has done commercials or promotions for major brands such as L'Occitane, Shu Uemura, Microsoft (MSFT) Xbox and Nikon (NINOY). Ads featuring his image are plastered across the city's public buses, airport baggage carts and subway stations. Groupies can buy handbags, stickers, books and folders with his image. Brother Cream has been paid hundreds of thousands of dollars for his work, padding out a stellar five-page resume. So much money has flooded in that Ko started a non-profit to dole funds out for charitable purposes, including animal rescue and food aid programs. His fame has even helped bring more customers to Ko's shop, one of the few remaining independent convenience stores in a market dominated by international chains 7-Eleven and Circle K.
Brother Cream, who initially did nuzzle a hello to this reporter, later declined to answer any questions in favor of a nap -- in true celebrity fashion.